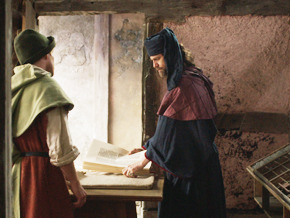 Gutenberg is responsible for the most significant invention of the medieval period: movable type printing. How could such an invention have come about in 15th-century Europe? This ambitious docudrama aims at showing exactly that: the struggle of an inventor who challenged the society of his time. This is an epic tale, with a protagonist who is by turns tenacious, cantankerous, shrewd, bold, cunning, epicurean, and passionate. It is a timeless story full of challenges, visionary ideas, alliances and betrayals. The birth of printing and Gutenberg’s adventurous life make up the rollicking tale of an invention that would change the world.